Planning a Michigan Wedding with Pearls Events: Planning Tips | Pantone Your Wedding, Finally! Pantone has provided the design world standardized colors for over 45 years, and it's about time someone used that to their advantage in the wedding industry. Dessy Group, which includes Dessy Collection, Lela Rose, After Six and Alfred Sung, has created Pantone Wedding, a website that lets you completely customize your wedding, starting with the colors you love. You choose your wedding colors, put together inspiration boards, and can then share everything with your wedding party & parents, and forward onto your wedding planner, florist, photographer, etc. They make browsing the Dessy Group for dresses and accessories that fit your color scheme easy. Check out Pantone Wedding today and read the press release here for a bit more info. My clients usually come in with SOME idea of what they are thinking as far as colors go, and if they are still searching for the perfect shade, I ask them to pop into the paint department at Home Depot to look at hundreds of colors, but this site is definitely going to come in handy from now on. Thanks for my fabulous intern, Amy, who works with Pantone at her day-job, for sharing this with me. That is AWESOME!!! 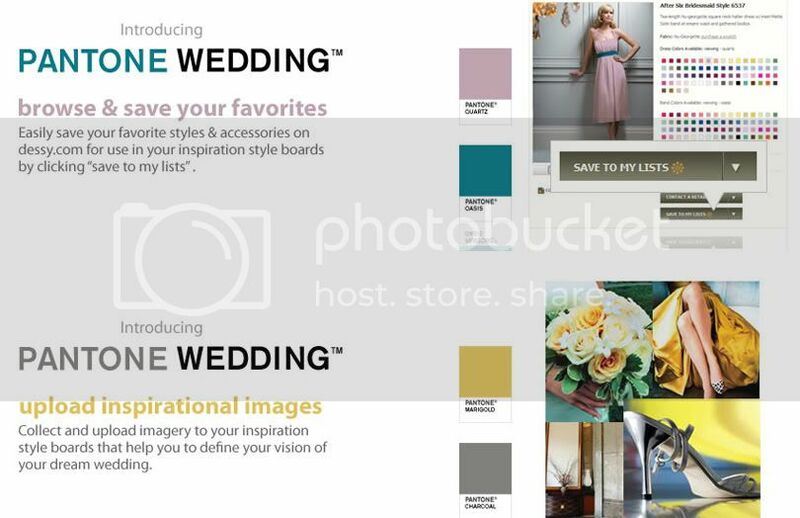 It will be nice to know the Pantone color when working with a long distance bride. I can just look in my swatch book to see the exact shade! It's hard using descriptions like sage, lime, kiwi etc. because every one seems to have a different idea of what a color looks like- even dress designers! It's about dang time someone did this! LOVE LOVE LOVE!!! !